My blood counts are still very low (except for my hemoglobin), but I do not need any transfusions or antibiotics. Hopefully, they will continue to get higher before my next chemo treatment, currently scheduled for about 2/23/08. 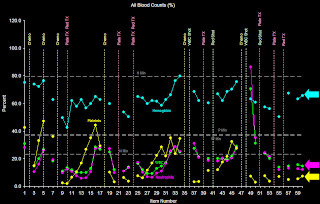 My counts, click for a larger image. To view a larger graph, please click on the picture. My counts are shown as different colored points from left to right. Sometimes they are joined by a line if I have my blood checked back-to-back. If there is a gap, there is probably a vertical line showing a treatment such as chemo, an injection (shot), or a transfusion (TX). My first chemo treatment is all the way to the left, while my last chemo treatment will be the furthest one to the right. Basically, chemo will eventually make my counts go lower (down on the graph). For example, if you scan from right to left, the first vertical line that you come to labeled "Chemo" at the top is my last chemo treatment. To the left of that line, my counts will decrease in value. 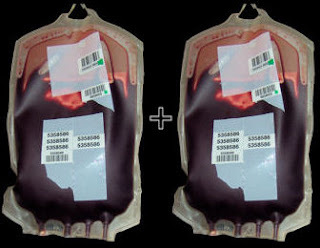 Treatments such as shots or transfusions will make specific counts go up. The light blue arrow points to my current (as of this morning) hemoglobin count (blue circles). It got a big boost from the RBC TX (transfusion) represented by a labeled vertical line. It did drop twice since I received the RBC TX, but now it appears to be headed up. The pink arrow is pointing towards my WBC (green circles) and my Neutrophils (pink circles). Neutrophils are a type of WBC, so they have a similar value. They are still trending slowly downward if you look at the right side of the graph. If they go much lower, I will have to take antibiotics. The yellow arrow is pointing toward my platelet count (yellow circles). My platelet count seems to be slowly rising. Hopefully, they will continue in this direction and I won't need another platelet transfusion. If you look back from right to left, you can see vertical lines where my platelets have been transfused. Accordingly, the count will come up, but then tended to go back down again. I'm posting this note about nine days late... I received a report at 10:20AM on Friday, 2/1/08, that my hemoglobin and White Blood Cells (WBC) were both low. For the WBC, I had to take an antibiotic daily which I already had from the last time they went low. For my hemoglobin, I had to get a transfusion of Red Blood Cells (RBC) scheduled for 7:30AM the next day (Saturday).